A unique theme for this year's event is "Forschungsgeschichte als Aufbruch. 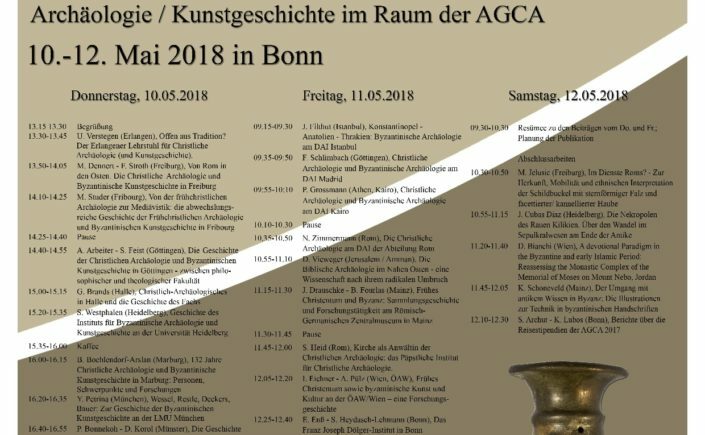 Die Geschichte der Christlichen Archäologie und Byzantinischen Archäologie / Kunstgeschichte im Raum der AGCA", that will address the study of Early Christian and Byzantine Archaeology by AGCA-affiliated organizations (universities, museums, non-profits, historic preservation studios, etc.) and guest institutes. ICS Advisor, Prof. Christoph Markschies, Professor of Theology and Ancient Christianity at the Humboldt-Universität zu Berlin will be presenting with Prof. Tomas Lehmann on the collection of Christian artifacts at the Humboldt-Universität zu Berlin. There is also a session dedicated to work in progress by early career researchers.